I am convinced that to nurture a future audience for theatre – all theatre – we need to get ’em while they’re young. In Vancouver, this is where Carousel Theatre comes in. General Manager Jessie came to Carousel via the Chemainus Theatre Festival on Vancouver Island with a BFA in Dramatic Arts from the U of Lethbridge, finding her niche in Administration. She also sits on the Board of Directors of the Jessie Richardson Theatre Award Society. Wild. I just drank a huge coffee and my heart’s beating faster than it probably should. 2. In your own choice of word count, describe the present condition of the Vancouver theatre scene. So many thoughts come to mind… I think many are hurting from the apparent lack of support from some funders, but most are gathering strength from the gads of encouragement being provided by audience members and others in the community. I’m concerned at the amount of artists, administrators, designers, technicians, et al that may be part of a mass exodus to higher ground (or cities/provinces/ areas) during this funding crisis. I’m excited by national and international works that are coming to town in the coming months. And I am constantly blown away by the amount of passion and drive that this community has. 3. Please describe the mandate and vision of Carousel. Carousel Theatre is dedicated to inspiring, enlightening and entertaining young people and their families through accessible theatrical experiences that develop audiences and artists. Our work is playful, relevant and vibrant. We are committed to artistic excellence and the support of emerging talent in all areas of the theatre discipline; we believe that youth audiences deserve the very best. Our programming offers a wide choice of exciting theatrical experiences for young audiences and families, and aims to enrich the hearts and minds of today’s youth. Carousel Theatre plays a unique role in the theatre ecology of our community, and is the only theatre company in BC that produces a fully professional season of mainstage programming especially for young people. Each season more than 60 000 young people and their families benefit from Carousel Theatre’s unique programming. Under the vision of Artistic Director Carole Higgins, Carousel Theatre stages a mainstage season of Literary Classics at the Waterfront Theatre, an Elementary School Touring Program that brings theatre directly to students, a Teen Shakespeare Program each summer and a year-round Theatre School for young people ages 3 to 17 years. Carousel Theatre also runs a mentorship program for fledgling theatre for young audiences companies and a new play development program. – To create theatre especially designed to encourage youth and family audiences to enjoy the benefits of live theatre. – To provide a means whereby actors, directors and others engaged in the creation of live theatre may develop their skills through experience and training. – To cooperate with other persons and organizations engaged in theatrical ventures and thereby provide an outlet for their work. – To welcome and encourage artists who mirror our culturally diverse community. – To assist & promote the production of Canadian Theatre and Canadian Theatre Artist. 4. How has Carousel been (or potentially will be ) affected by the Liberal’s budget cuts to the Arts? – We have had to put our Elementary School Touring program on hiatus. We had been touring within the Lower Mainland, BC and throughout Canada. Our touring program has served just over 39,000 students, teachers, and families in the past year. We’re saddened by this, as our touring program has been gaining quite a bit of momentum as of late. – Less tickets available for donation to inner city schools and community groups. – Our accessible ticket prices may need to be increased. 5. How can we attract more artists to the administrative side of the industry? Current administrators in the community can snap up young, driven emerging artists who are wanting to learn more about the administrative side of theatre to gain skills for producing. These artists who have a talent for the admin side are in desperate need as the theatre community grows and maintains itself. I would recommend any artist to pick up some admin skills- you’ll put those tools to use every day. Even actors- you are a business just by being you! Pick up accounting skills to help yourself at tax time, learn how to send an email (with proper punctuation and grammar), think about marketing yourself or your co-op with a website/blog/etc. 6. Who or what are your great influences? My friends are an amazing source of inspiration every day- as hokey as that sounds. They are willing to put themselves on the line as actors/producers/designers/musicians- and do what they love, regardless of the risk – as long as they can create. It makes my heart burst, but not in a sticky gross kind of way. I am also influenced by a great friend- Jeremy Tow. He is the first Artistic Director I have ever worked with as an administrator (while an arts admin intern at Chemainus Theatre Festival), and I will always be in awe of his work, his grace and his passion. I would also like to mention a particular professor from university who once said about me “She’ll never be a director, but she’d be an amazing administrator.” I hated him with a passion for about 3 years before realizing he was right. I found my home within this community, and it brings me great joy to know that the cogs on this great machine of creation keep turning because of the work administrators do. We help facilitate the artists – which can be an art unto itself. I love small-scale musicals like Edges, The World Goes ‘Round, etc. I would love to see more new musicals done in Vancouver by smaller companies. More companies taking risks with unusual venues (site-specific, or alternative spaces). Though extremely unlikely, I would also like to request a monthly version of HIVE. 8. What do you know about theatre that you didn’t before working with Carousel? How amazing it is to introduce children to live theatre. That children make the best critics. That having diverse revenue sources are so important (use what you got!). That you can get tired of the colour purple. That communication is everything. 9. What’s the best way to build our future audience in Vancouver? Provide them with the best theatre experiences possible, no matter of their age, background, income. Keep theatre accessible to all. 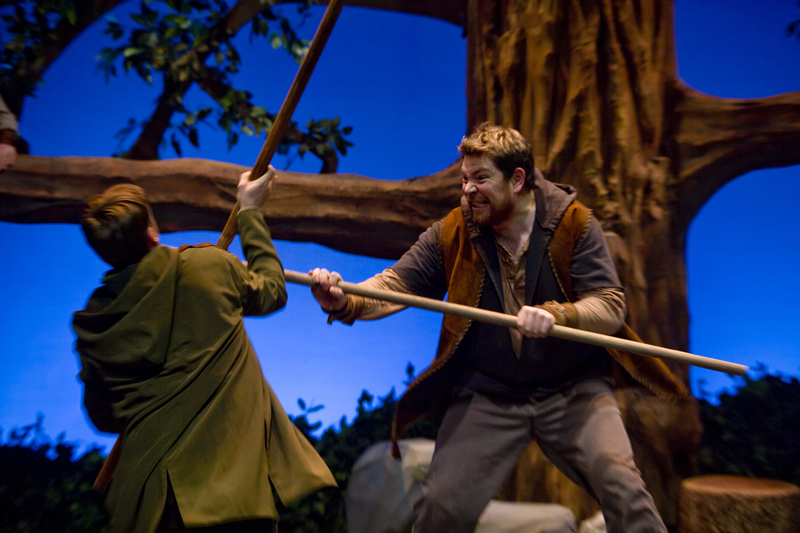 Encourage all theatre companies to have one pay-what-you-can performance. Create relationships with your audience members outside of the venue. Garner the support of local print media to continue providing coverage for productions that may be considered ‘small’, ‘indie’ or ‘not big enough’. 10 years: Queen of the World! 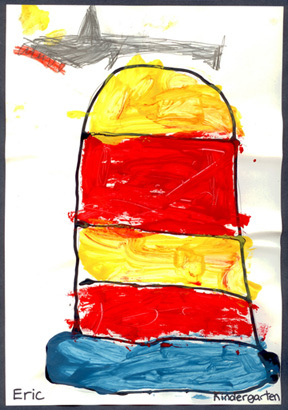 Child’s artwork created for the first run of Seussical. It is Jessie’s favourite because it has a shark. She likes to think that Eric, the 5-year-old artist, thought “Yes, I’ll draw the hat that I’m supposed to draw… but I think it needs a man-eating shark on it to complete my vision”.